Footballers from Derry have struck up a wonderful friendship with their counterparts in Westport over the years and 2019 marks a landmark anniversary of that special connection. FAI National League Underage officer and Westport native, Pat Duffy who now resides on Foyleside, recalls how football proved the basis of friendships which have stood the test of time. “It started 50 years ago, when Frankie Campbell, ‘Hoppy’ McGinley and the late, Jim McDermott, all from Derry, lined out for Westport United,” explained Mr Duffy. “Ivan Parke, Stevie Wilkinson, Herbie Barr, Joe Healy, Bobby Ross and Joe McBreaty have all worn the red and black of Westport in years goneby. “In the early ‘70s during the Troubles, Big (Jon) ‘Ugg’ Clifford brought down young lads to stay with host families in Westport. “It continued into the 80s and 90s when Brandywell Harps would come down every year to play in Westport. Danny Melly, Micky Doherty and ‘Stout’ Ferguson would lead Brandywell Harps with Westport returning for the away fixtures. “In 1987 Derry City offically re-opened Westport United Sports Park following its renovation with Jim McLaughlin and Noel King as manager and player coach at the helm. 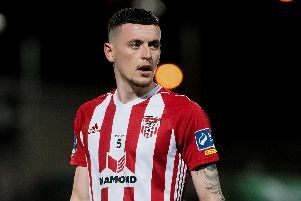 A young Pascal Vaudequin made his Derry debut on that day,” recalled Pat. Over the past 10 years Derry City legends have made it a traditional excursion to Westport with club legends such as Liam Coyle, Felix Healy, John Quigg, Gary Beckett, James Keddy and Paul ‘Oxo’ McLaughlin making the trip. And the Legends will return to Mayo in September. Young Derry teams compete in the annual Duffy Cup in Westport with Derry Colts, Ballymoor (winners) and Oak Athletic all flying the flag for the city. So the connection has lasted a lifetime and it is down to the goodwill of people from both Derry and the picturesque town on the west coast of Ireland. The teams taking part in raising money, is ‘Hope on the Move’ (staff from Derry City Council) and Micky’s Bhoys from George’s Bar. Tickets are priced £5 and everyone who buys a ticket is in with a chance to win a weekend away in Westport and also one in Dublin.